Are you curious about Bell Street Chapel or Unitarian Universalism? We’d love to introduce ourselves. 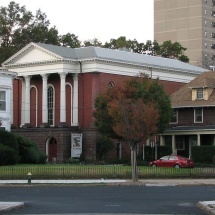 Bell Street Chapel is a small regional Unitarian Universalist congregation serving members from urban, suburban and rural greater Providence communities. In the Unitarian Universalist tradition, we draw upon many sources for strength and inspiration, include a range of theological positions, and believe in freedom of conscience. We have no creed or dogma, but we do have deep personal convictions. Located in the West End of Providence and founded in 1889, Bell Street Chapel has a rich history and welcoming spirit. We invite you to visit us on a Sunday morning or for any of our many programs or community events. Click here to learn What Visitors Can Expect.